The world of wine can be a little confusing - especially if you're a newcomer - and some of the many words, terms and lingo used to describe wines can easily leave your head in a spin. However, with the help of this infographic from Wine Folly you'll realize that with a bit of practice and some light reading, you too can speak like a wine expert. 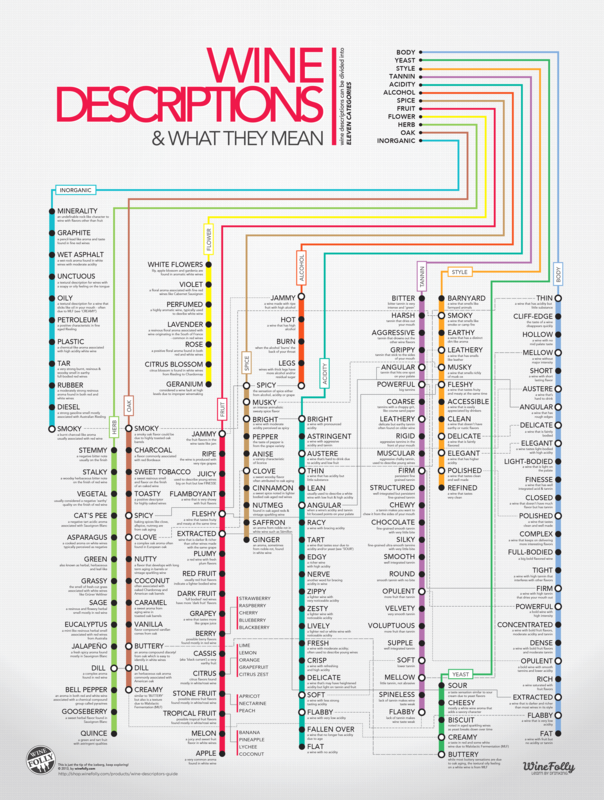 It breaks down descriptive wine vocabulary into 12 sections: Body, Yeast, Style, Tannin, Acidity, Alcohol, Spice, Fruit, Flower, Herb, Oak and Inorganic - offering words that can then be used to offer great descriptions for each characteristic of wine. Take a look and with a bit of practice and some basic understanding of wine you'll be knocking out professional sentences in no time at all: "mmm tastes fleshy with a real anise property, the oak barrel has certainly given it a smoky finish". Nice, but want to take it a step further? How about: "There's a noticeable minerality to this wine, it's got this dill like aroma and I love that buttery oak finish. All-in-all I'd say this is a flamboyant wine that, although a bit astringent, seems to harbour powerful tannins with a very polished finish, it's truly complex."